After nearly three years of renovation and expansion, the long anticipated Erb Memorial Union project is complete and the campus is ready to celebrate. 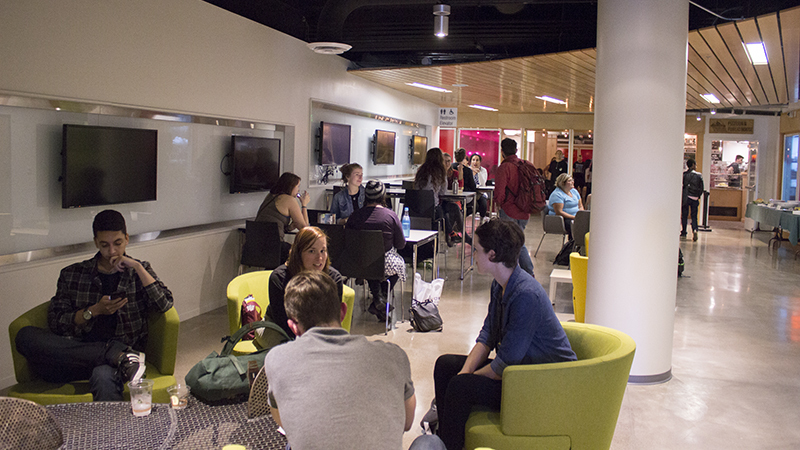 As the heart and hearth of campus, students, faculty and staff are being welcomed back with a variety of eateries, student organization offices, study spaces, services and even a Duck Store. The new space offers a little bit of everything. From Northwest food staples like coffee, tea and ice cream from Starbucks, Townshend's Tea and Red Wagon Creamery to pizza and burgers from Falling Sky Pizzeria and Public House and Joe’s Burgers. But it doesn’t stop there: Burritos, sandwiches and Chinese food are also in the mix with Chipotle, Subway and Panda Express. A Fresh Corner Market is coming soon. Visitors can explore creative whims at the Craft Center and get some much-needed relaxation at the Duck Nest, the new student wellness center. The EMU also serves as the hub for the Associated Students of the University of Oregon and many student organizations, where Ducks work together to accomplish their missions and better their communities. The building originally opened its doors in 1950 and over time the need for more space grew as the campus grew. Work on the expansion and renovation began in spring 2014.